On my first trip to Keweenaw National Historical Park I expected to see a visitor center and a few old buildings. I discovered much, much more. Starting at the visitor center in Calumet, Michigan, I explored three floors of exhibits, sampling interactive features to watch films and hear recordings on replica telephones. After taking part in a few ranger-guided tours, my interest was sparked. I'd found a treasure that would keep me coming back for more. Fortunately Keweenaw is a partnership park, collaborating with 21 affiliated Keweenaw Heritage Sites to share the region's rich past. Copper, the “heart” of the area, was the lure that brought people of many nationalities to the peninsula. 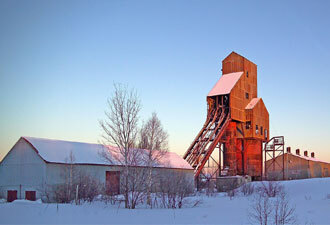 To delve into the area's mining history, I walked down wooden stairs into a self-guided mine tour, passing through underground tunnels to a scenic vista and even riding a cog-wheel tram downhill to an adit, a passageway into the mine. This tour gave a true sense of hardships underground. Above ground, old shaft-houses, hoist houses, and boiler houses made clear how large and expansive these mining operations were. Each museum visited added depth to the cultural story. Household items, old cast-iron stoves, and clothing displays gave insight into family life. Historic tools and manufacturing displays illustrated how other industries, such as logging, also benefitted from the area's wealth of natural resources. Visiting old homesteads, I imagined how harsh the winters must have been for people living in wooden structures and relying on flames of well-kept fires for warmth. Life from the early 1860s mining days through the 1960s, when copper mining ceased, was much different than today. I rode an old steam engine and stood staring in awe at vintage fire trucks and vehicles. After exploring historic modes of transportation, my curiosity turned to waterways and the challenges people faced while trying to reach the rocky shores of Lake Superior when no mode of land transportation existed. My thoughts turned to lighthouses, such as the Eagle Harbor Lighthouse operated by the Keweenaw County Historical Society, and the work of the lighthouse keeper. A seemingly lonely job, even with family around, the keeper needed to keep the signal going day and night. He ran up spiraling stairways that I could barely fit my foot on to aid ships' safe passage as they traveled near land. Military life, though short-lived in Copper Harbor, is another piece of the story. Reenactments brought this history of the early 1840s period to present life. Blacksmiths, men chopping wood, and women cooking presented new aspects to contemplate. 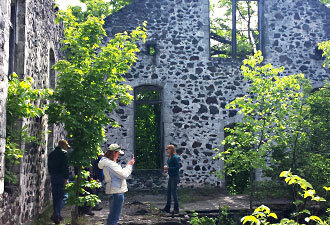 I even traversed a section of the North Country Trail, visiting an old boiler house along the route. I walked into historic theaters and churches, discovering archways, painted murals, and stained-glass windows incomparable to architecture I had previously known. Humans have history here, but so does the land. Glaciers and fault lines created a unique landscape filled with old-growth forests, cliffs, and rolling hills encompassed by Lake Superior. Beauty surrounded me throughout my trip: in wilderness, in architecture, and in the stories that the cultural history and landscape conveyed. My experience was the tip of the iceberg. I left with many new memories and the desire to discover more. Luckily, I can always stay connected to Keweenaw National Historical Park through social media! 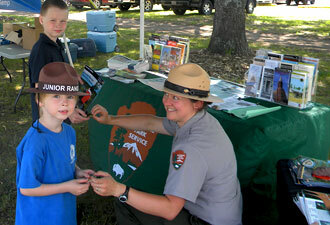 Editor’s note: The author, Krysten Hintz, worked as a summer seasonal interpretive ranger in 2014 at Keweenaw National Historical Park. She earned her BA in environmental education and interpretation from the University of Wisconsin–Stevens Point and hopes to return to the National Park Service next summer after her first year teaching elementary school students.